The MENNEKES LockOUT-LET all-in-one, pre-wired pin and sleeve switched and interlocked receptacle helps make power delivery safe and secure. A patented interlock mechanism prevents the switch from being turned "ON" unless the plug is fully inserted, and it stops removal unless the switch is in the "OFF" position. 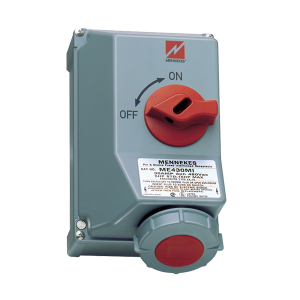 A tough, NEMA 4X; 12-rated enclosure provides maximum resistance to chemicals and impact. LockOUT-LET receptacles accommodate IEC 60309-2 plug configurations, and they are especially suitable for use with welders, pumps, break-out packaging equipment and other devices that typically get moved in demanding industrial environments.